No cash. No parking ticket. No queue. Just your licence plate scanned and the transaction verified via your smartphone at the entrance and exit. Who wouldn’t want to arrive and depart Just. Like. That? 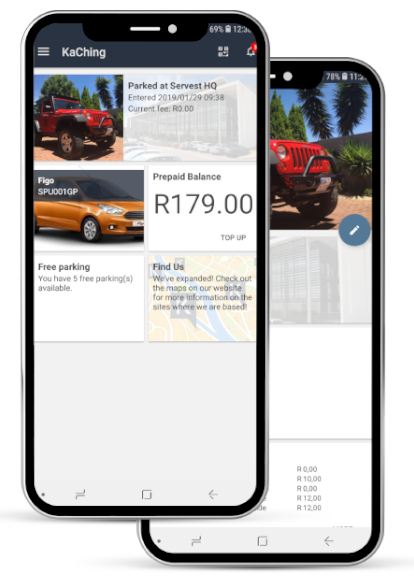 KaChing is a cashless, ticketless, user-friendly parking app which uses license plate recognition to open a boom when a user arrives at a parking lot. Payment is linked to the user's credit card or pre-paid account upon exiting. 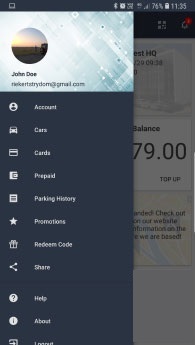 KaChing makes your parking experience hassle-free and cost-effective. Upon arrival at the entrance your license plate is scanned by our cameras, and the only opening done is the parking boom. Windows closed, come rain or shine! 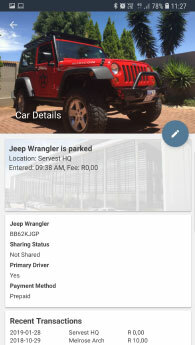 A parking transaction is automatically opened and the app will send a notification to your smartphone, informing that the registered vehicle is currently parked. Park and spend your time where it matters. Plus, by accessing the app at any given time, you will be able to verify the duration and cost of your parking in real time. Once you're ready to leave, skip the ticket queue and simply drive to the exit where your license plate is once again scanned automatically, and the boom opened. 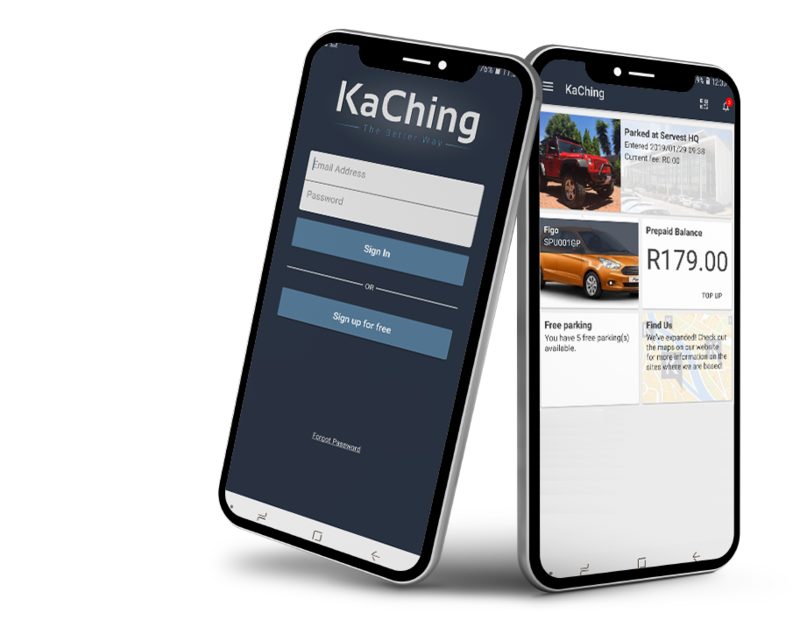 We at KaChing have put a lot of thought into what makes a good product, and we have strived to bring users more value when choosing cashless parking with us. Your credit or cheque card details and transactions are always securely processed by reputable gateways. 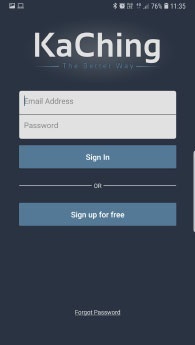 Download our app from your app store, register and setup your account, then go get your KaChing on. No counting coins or saving notes, not even a queue. Just smile and wave, leaving everyone in the queue clueless. 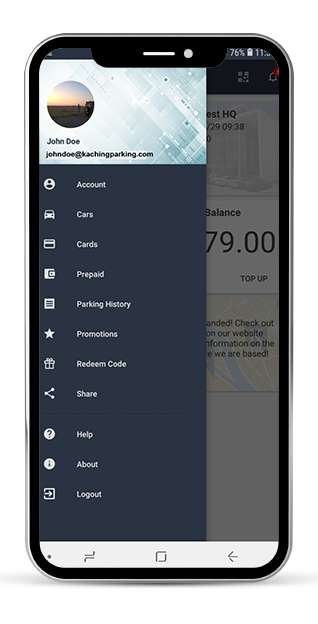 The KaChing app is completely free to use, and you only pay for your parking as you normally would. 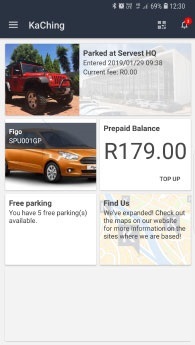 your profile, vehicles and payment methods effortlessly. Android users on the Apple app store, and the Google play store. just follow the map below to find your closest KaChing-enabled centre! and frustration by signing up with KaChing today. We're all so completely different and yet we have some pet peeves in common: queues, frantically searching for change in our wallets and, of course, paying parking tickets with no available hand in sight. Our customer support team are ready to assist you with any queries your may have. Just get in touch with us on our support email address below.